What if the last affirmative act of Faith is just to say yes? What if what God wants most from us is to hear His Call and respond with willingness WITHOUT planning or programming anything that follows after? I don’t do coincidence. I believe that by Divine Design, God’s plan, more elegant and expansive than we could conceive, is on occasion revealed to us as connections we see, if our eyes are open. I imagine that those connections parallel those of the Master Plan, pared down for our understanding. In time, bringing perspective from recent experiences, along with the time to allow things to be revealed, I see differently. Our lessons await our readiness. What you need exists right in front of you. However, until you listen without resistance or complaint, receive and the apply what you’ve discovered, the lessons’ proximity is of no value. It is only time when its time. Having said that, back to the original question. 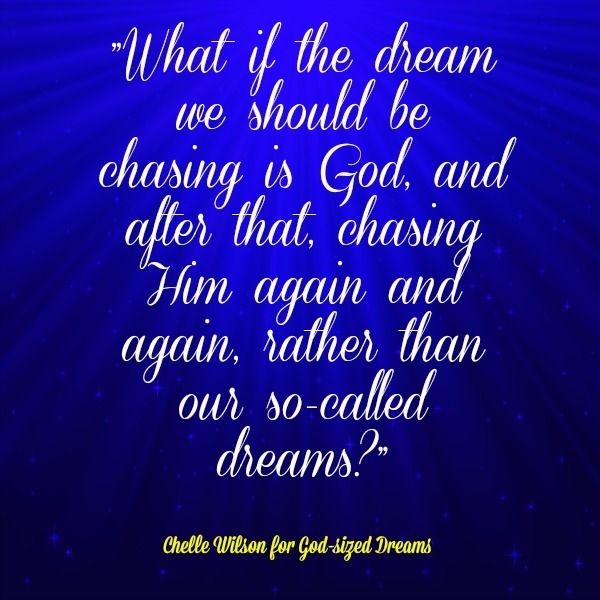 What if the dream we should be chasing is God, and after that, chasing Him again and again, rather than our so-called dreams? I recently took a risk, committed to God, and let go what I thought my dream might be. I forgot my dream and chose to remember the Dream Maker. We spend so much time living in our own heads, hearing and experiencing life through our own filters that we need other people to keep us straight. Fortunately, I have a tribe that keeps me grounded. I was recently angry (again) with God. Please, don’t be alarmed, He knows, and it’s not the first time; we have an open, honest relationship. The dreams I thought I was pursuing for my life were dashed. My career, long-stalled, might be ready for a restart, as I was on the short-list for not one but two compelling opportunities. Citing God’s sense of humor (and married to it, His Overwhelming Love for me), I received rejection emails from both companies on the same day. Doors Closed. FIRMLY. Because I am human, I pouted and railed at God, needing to be angry, to express my disappointment, and to be forthright. I committed to stop being dishonest with God years ago….He knows anyway. I gave myself 24 hours to be mad and hurt and then committed to GET OVER IT. The next morning, following my daily routine, I sat down for a few minutes news after shuttling both son and husband to work and school. Offhandedly, I applied to the 16 to ’16 challenge. As part of my getting over it, I offered a quick prayer…essentially, that if my faith was to be real, I had to let go of my notion of my dream and trust God. Within hours, He showed up. Not only did I hear from the TODAY SHOW team, seven days later I was preparing to be on the show. Holley Gerth, dear friend and godmother to my God-Sized Dreams, acted as chief of the grounding squad for me in this case. Asking for prayer from friends as I was about to dive of the comfortable, cloistered cliff of my life, called me out, big time. So much for my notions about what should be on Facebook, what I should be into the world, and what my little brain might determine would be God’s Will for me. I know not. I don’t know. But here’s what I know…I need to hush. I need to be quiet. Since I have committed to just saying Yes to God, “Make me silent” has become my prayer. I whisper it often lately given the amount of much noise in my life. Much of that noise I make myself; television, music, self-talk (some good, some not so good), to-do-lists, advice and guidance to my children, admonishment, my fears, my concerns, my dreams. So much noise, that often “that still small voice” speaks and I cannot hear it. That’s not good, and it has got to stop. Lord, I desire to hear You when You call, when You encourage, when You teach. So, this is my prayer, “make me be still.” It has never been my will, so I’m giving up. It was never my dream anyway…and as I have learned….His Plans are always better. I read recently that “sometimes we need to step back and let God take control.” That’s wrong. We’ve never been in control. That’s why I am forgetting about My dream, and remembering the dream maker. That’s all I’ve ever needed. Bios tell readers who you are. She prefers that you engage her and decide for yourself. She clutches inherited pearls while tossing dreadlocks. Contentedly enigmatic, read her words if you really want to know who she is. What’s on her playlist as the rhythm of her soul? Hymns, anthems, jazz AND jazz vespers, hip-hop, Gospel and Gregorian Chants. Her gorgeous Boxer Sando taught her so much about Faith, Love, and Trust that she wrote a book about him. Her first love married her nearly 25 years ago, and together with God, they made two beautiful people and a life. Find me at Treat Me To A Feast:Notes From My Abundant Life, on Twitter, Instagram, Facebook and at Amazon.com. I am a regular contributor and founding writer at God Sized Dreams. For four months last year, you could find me on NBC’s Today Show. Who knows where I'll turn up next?? Ah Chelle! Surrender is a hard-won fight. No we never have been in control, but we have such a hard time believing this! Love your words as always! Yes I to have a dream that is close to my heart. I ask and hear nothing, no whisper, nothing. So do I give up and accept what is or continue to ask?